Unlike a normal clock, this funky modern timepiece keeps its hands stationary, letting the numbers on its dial rotate around the hands to tell the time. A simple gear-drive mechanism moves the outer ring around the clock mechanism. 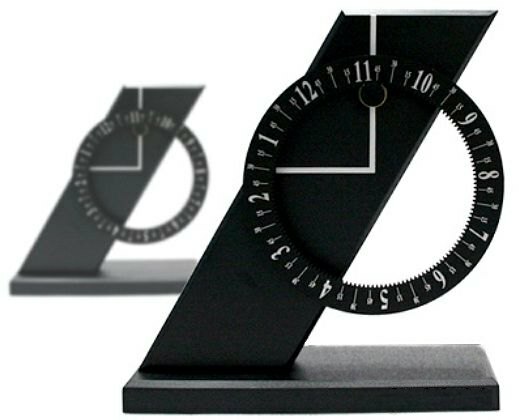 The desk clock gets it’s name, “Pisa” from it’s eye-catching leaning tower design. And if you really feel like going all out with the 12th-century Italy theme, the dial can be reversed to show roman numerals instead of digits. So far I’ve only been able to find this clock from Korea’s Earlyadopter Mall (priced at 15,800 KRW, about $17 USD) but post a comment if you manage to find them somewhere in North America.